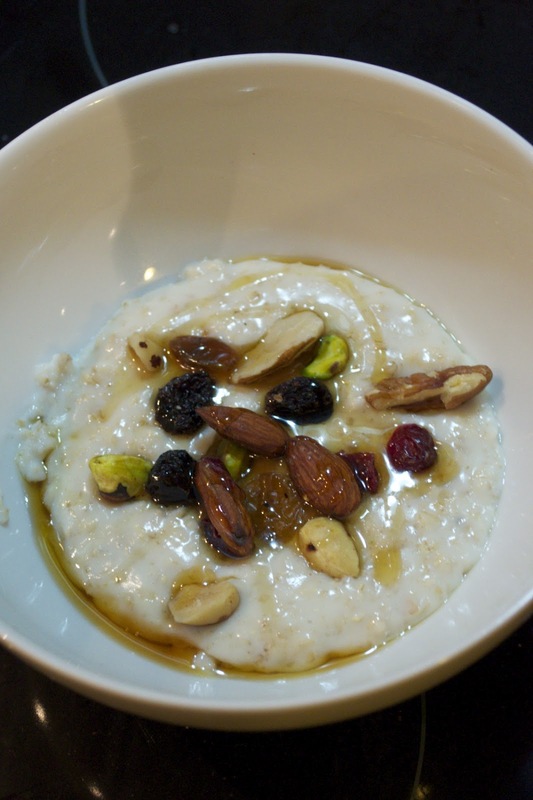 It's been a while since A has uploaded a recipe, and C keeps raving about A's porridge-making skills, so A thought he'd throw up a quick post on how to go about making the stuff. A likes to start his working day with a bowl of oats as he finds it sets him right up for thinking through the morning and prevents him from snacking an hour and a half or so before lunch. C jokes that A likes to start his day with a brown breakfast - coffee and porridge - and The Today Programme. A doesn't agree though, as often it's a good deal more interesting. 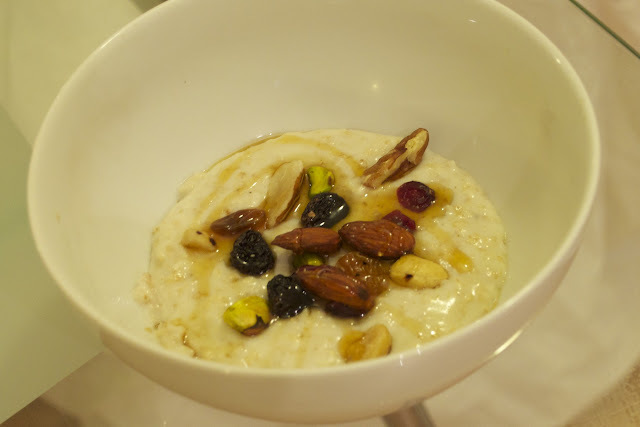 A always makes his porridge with semi-skimmed milk (lacto-free as A is lactose intolerant) and uses rolled oats rather than jumbo or steel cut ones. A also works on the basis of one serving of 40g of porridge to half a pint of milk. Though not strictly necessary, A uses scales and a measuring jug every morning to ensure that the consistency is even. As with the hummus, there are essentially two tricks: don't be stingy and don't rush. Porridge is one of the cheapest hot breakfasts around, so why worry about the extra pennies you spend per bowl when you buy fancy oats? The better the quality of your ingredients, the better your finished product will be. A likes Flahavan's organic oats, available at Waitrose, and Sainsbury's Taste the Difference oats, but anything a bit better than the cheapest offerings will do. The gentler the heat over which you cook your oats, the better. It's possible to nuke porridge in a microwave and have the job done in five minutes, but you should really take your time. Try not to let the porridge boil. This scalds the milk, making it stick to the bottom of the pan, discolouring the porridge or worse, you stir burned bits in to your meal. 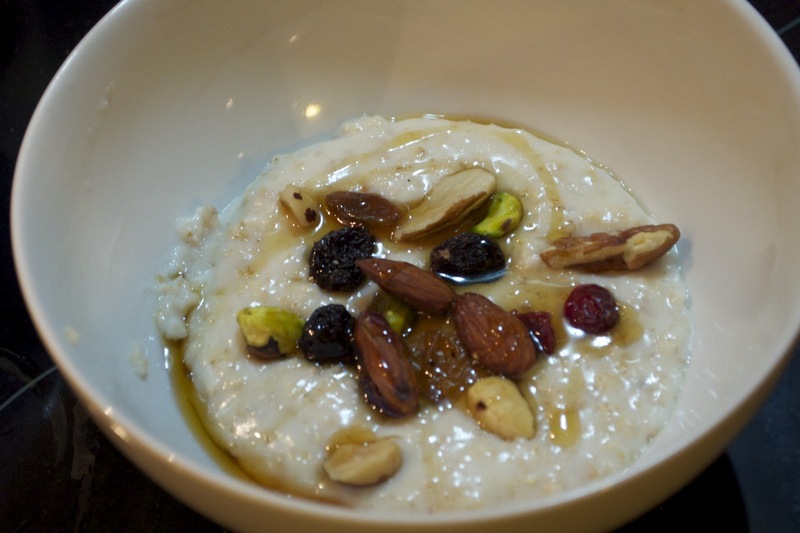 Also, if the porridge oats have time to soak up lots of liquid, you end up with a wonderful starchy thick consistency. Porridge is not to be rushed.